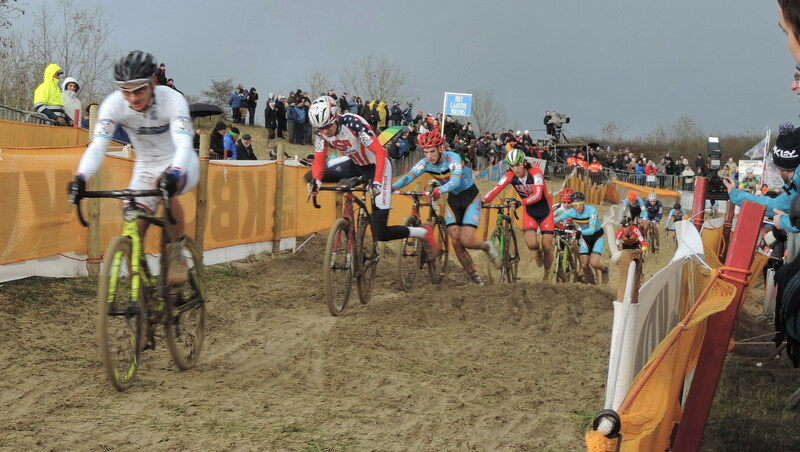 Rainbows came to the Belgian coast in more than one form: firstly the much anticipated return of World Champion, Mathieu van der Poel, secondly it was raining like buggery between sunny spells and you know how good rainbows look against a dark background, right? Having driven through plenty of rain it was a little disturbing to see hail lying on the ground as we got closer to the course. Of course, it wasn’t until we got out of the car that it unleashed , but it was just a short hail shower. Heading for the coast means another early start, but even so we didn’t make it in time for the Newbies and the Juniors were already on course. No dramas getting in just the metal detector cos we left all bags in the car. It just adds to the adventure. To the on site pub, ‘t Liefoord, for coffees and a warm toilet (the essentials of life!) plus a quick catch up with a few familiar faces. The we went to check out the course, which had a had a couple of changes since last year but nothing too drastic except that the place where I was last year in the centre was no longer available and the the flyover was at 90 degrees so the riders go over it whereas before there was a double bridge for spectators. The big screen, frituur and beer tent were all present and correct. 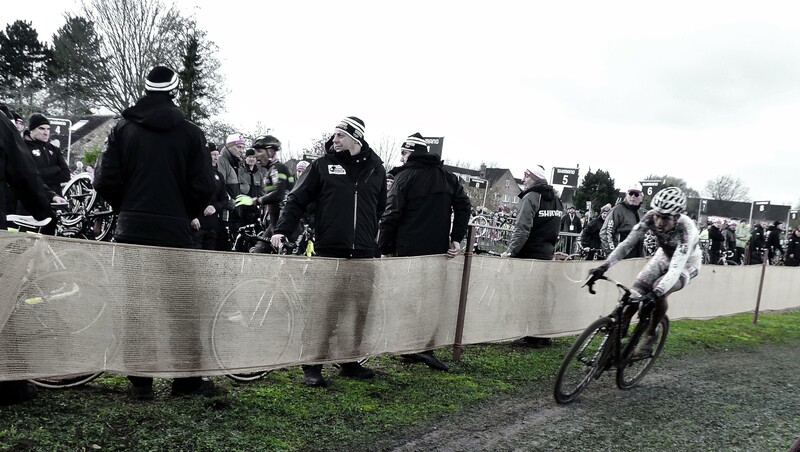 I headed off to have a wander for the U23 race and it was rather sad that the usual crowds had stayed away, however, I have noticed that there seems to be more English voices and accents here than at any other race, so big chops to the Irish, English and ‘Murcans for making the effort. 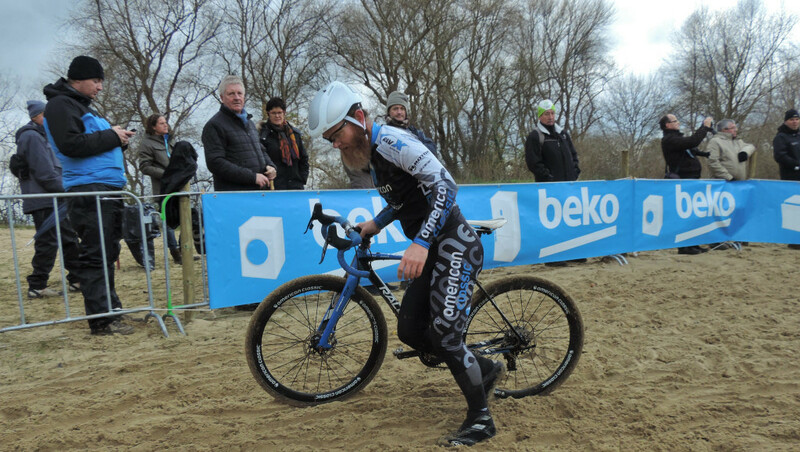 In the race Daan Hoeyberghs set the pace with Curtis White first to meet the challenge, albeit short-lived. 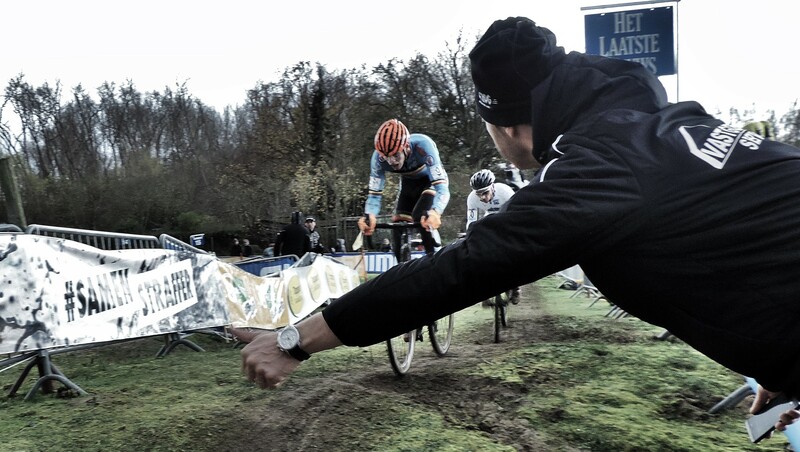 Eli Iserbyt gave chase and a big ‘Hello Again’ to Daan Soete, nice to see you back on the radar. If you are still one of those people who ahve a thing about the white lycra let me draw your attention to Gioele Bertolini, the Italian who was leading the World Cup standings at the beginning of the day (*ahem). The white lycra will now pass to Eli Iserbyt who was the eventual winner after a 3-way tussle with the 2 Daans. When I made it back to the guys, Papa Wellens was with them again for a natter. I think he’s an honourary guy as he’s always around this season. 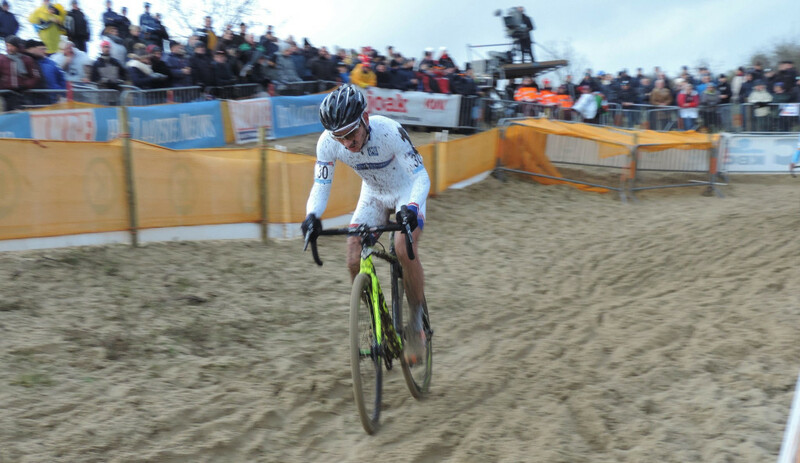 His prediction for the men’s race was Klaas Vantornout. I did get to ask for a Kevin and a ‘HUP’ (I did ask for a Sanne but no women’s names available (same old story, yawn) Next time eh,Telenet?) Passing by a group of 7 ‘LARS’ later I was sooo jealous! Not Cat Armour. © 2015 Cat Armour. After abandoning thought of going to the rider parking (queues for being searched by the police were deemed preventive) I went up the Albert dune and caught a few of the men practising. 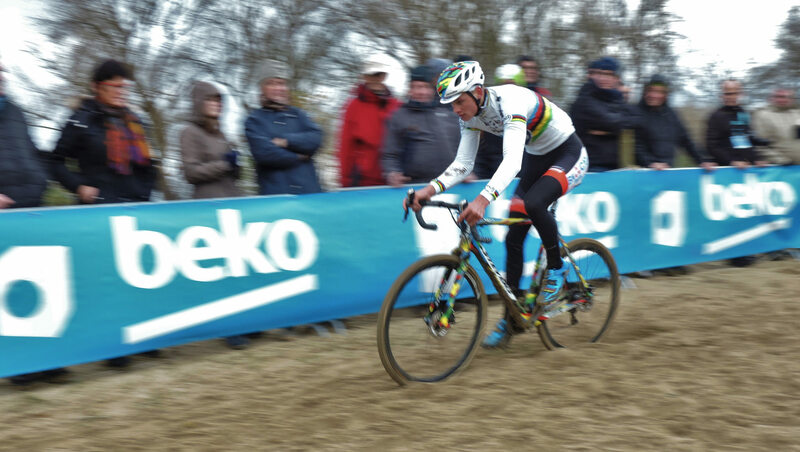 With talk and tweets about the new paint job on the Wout Colnago it was the Mathieu won-der-Poel Stevens that was the eye-catcher in Rainbow Camo. Honestly, it is totally cool. 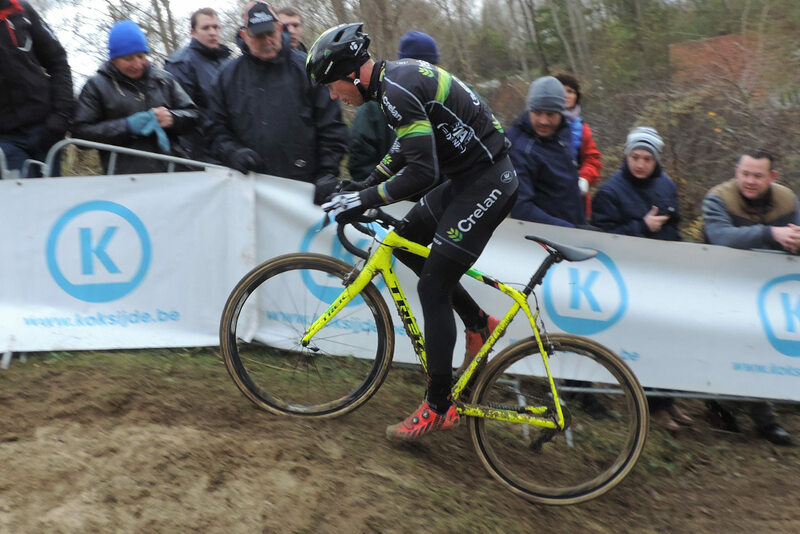 So much better than the Tinkoff Hi-Viz camo and the old ‘Sniper’ camo is so boring now. I do love how teams get all colour inventive though. With all these’ best of ‘ polls going around at the moment someone should do a best paint job category. I know where my vote would be going! 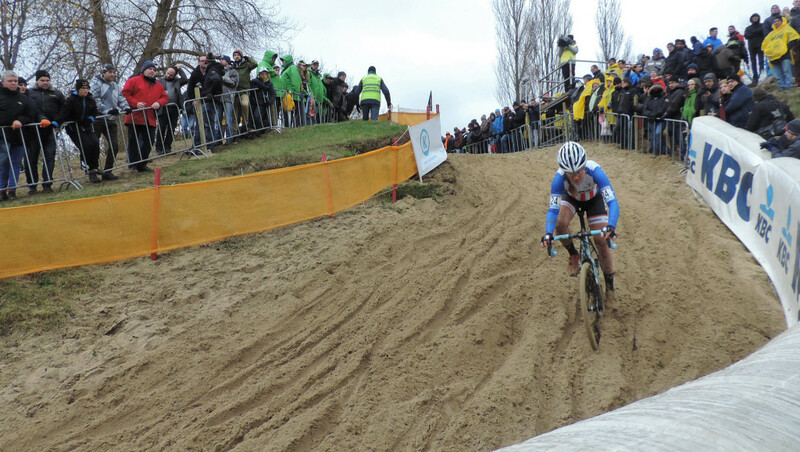 Gutted for the organisers, but good for me that I found a great, uncontested spot on the dune for the firt laps of the women’s race. This was my only opportunity of the day to catch the women riders and I’m afraid I was in KOMAAN mode as much as camera mode so pics are few, but no matter, there is VIDEO (happy dance). 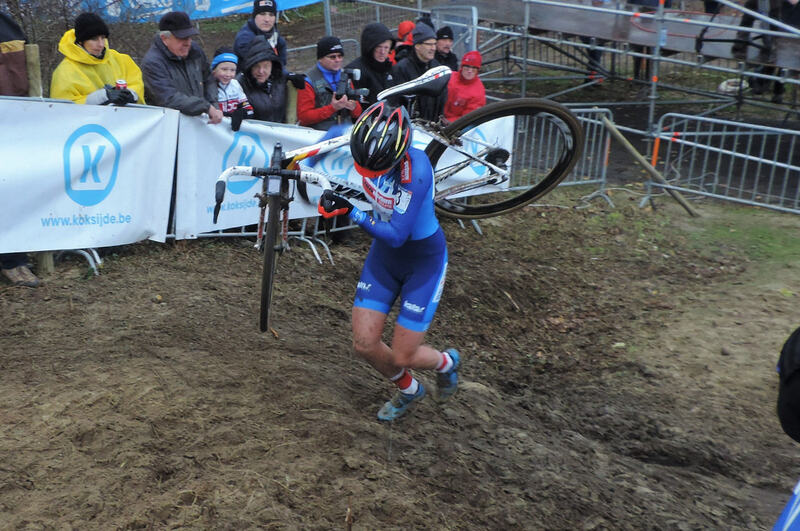 Sanne Cant was laying the smack down (is that an appropriate phrase for CX?) and she seems to be getting stronger with every race. 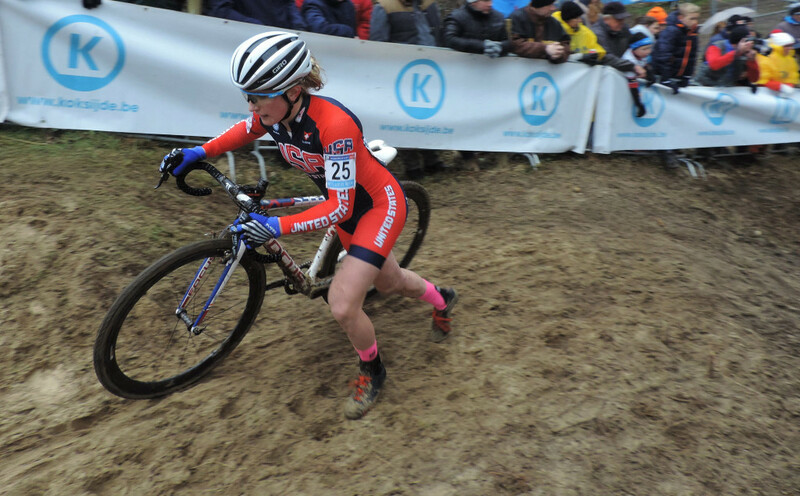 Plus she looks so cool in the Euro Champ blue. And a big ‘Hi, how are ya?’ to Katie Fn Compton. 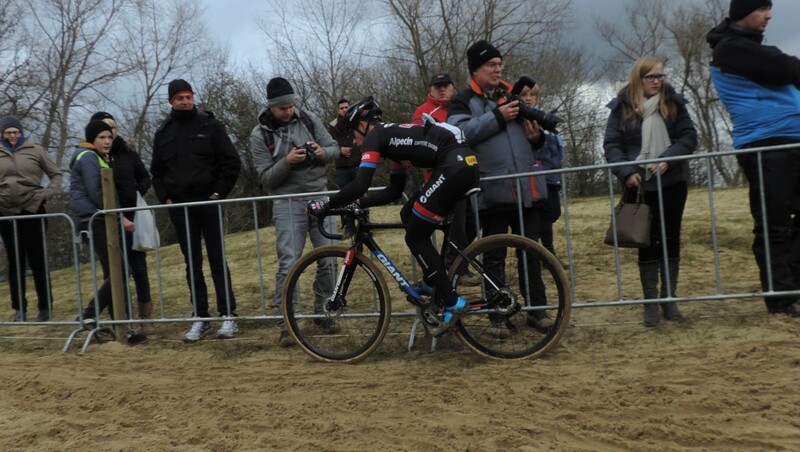 So good to see her back in the saddle on Belgian soil again. I made my way back to the guys for a catch up and a wee beer before the men’s race. The atmosphere was building after Sven’s victory in Hasselt and I can’t tell you how many times I heard people say they wished they had been there. 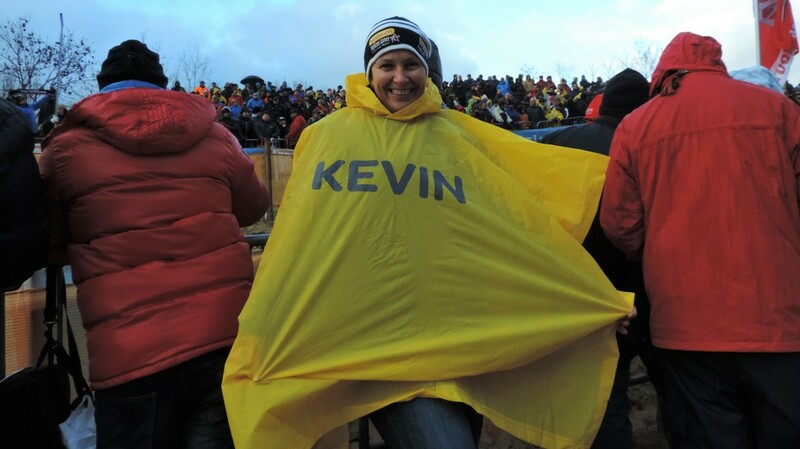 Of course, I was wearing my ‘Kevin” cape, but with the back problems evident from Hasslelt we weren’t expecting another ‘Ruddervoorde Romp’ (my term!). 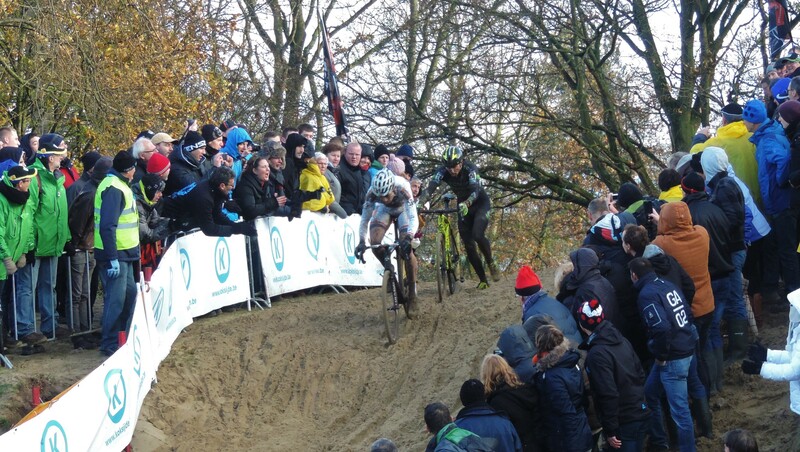 Mathieu and Wout came out swinging. Kevin had a bit of whoops and then got caught in a jam at the place where I was on the dune for the womens’s race (face palm) so was way back by lap 2. 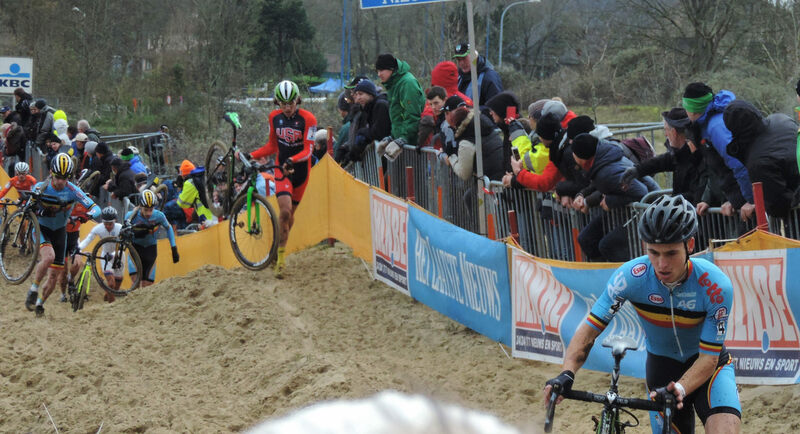 Meanwhile, Sven was steadily making progress to the front and, as Mathieu faded a little, we got the Sven-Wout showdown that had been anticipated. As the front two were having a private battle we got so engrossed and the camera’s did too, that all of a sudden we noticed 3rd place was Kevin! Alas, his back was having a right grump, but for a few minutes there there was much joy. yes, yes Yes YEs YES YESYESYESYES!!!!! Followed by jumping up and down, hats in the air and smiles bigger than the dune. Back-slapping and congratulatory handshakes all round as the SVENNOISE must play its part. 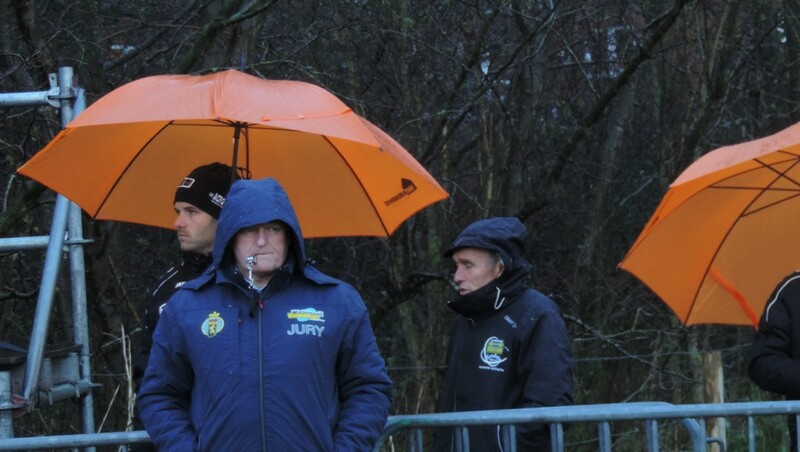 Suffice it to say, the Sven fans who missed out on Hasselt finally got their day. After the euphoria had dimmed a little we headed back to the pub in time to see the podium and grab a hot drink. The hail held off til we got to within 10 paces of the car (buggeration), but with the heater going we thawed quickly and it was a joy joy journey back. Happy Sven weekend, but next it’s Hamme-time (I really did type that). “I have noticed that there seems to be more English voices and accents here than at any other race”. Maybe because a bunch of us go over for Ghent 6 on the Friday and Saturday evening.